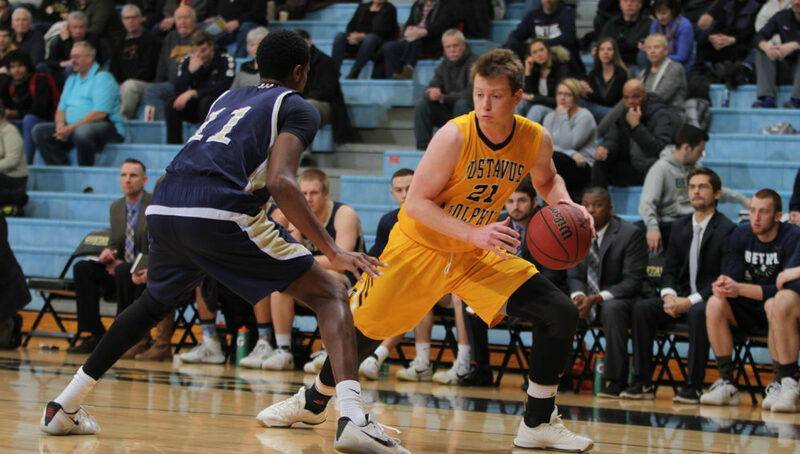 ST. PETER, Minn. – The Gustavus men’s basketball team had a 10-point lead dwindle in the second half as Bethel University stole a 70-69 victory Saturday afternoon at Gus Young Court, taking away the Gustie playoff hopes while earning a series sweep. The Gusties’ record drops to 12-12 overall and 10-9 during Minnesota Intercollegiate Athletic Conference action, while the Royals improve their record to 17-6 overall and 12-6 within the MIAC. In the first half, Gustavus gained a 29-26 advantage, shooting 6-for-14 from three-point range while limiting the visitors to just a 1-7 mark from beyond the arc. Riley Sharbono (Jr., Marshall, Minn.) held a game-high 11 points through the first 20 minutes, shooting 3-3 from long-range. The Gusties came out strong in the second half, jumping out to their highest lead of the game in the first few minutes. A three-pointer from Kelsey Thomas (Sr., Wiesbaden, Germany) gave the Black and Gold a 38-28 lead. Bethel countered with a 17-6 run to claim a 45-44 lead through the midway point of the half. During the remainder of the tight contest, the two teams exchanged leads seven times. The Royals were efficient from three-point range in the second half, draining nine of 12 attempts from beyond the arc while shooting 52.6 percent from the field, led by an 18-point half from their leading scorer Granger Kingland. Bethel held a 36-31 rebound advantage over the Gusties along with a 28-14 advantage in points in the paint. Gustavus shot 41.9 percent from the field (26-62) while recording a double-digit three-point field goal mark for the second consecutive game, going 12-29. Sharbono tied a season-high with five three-point field goals, leading the Gusties with 25 points off 9-12 shooting. Thomas followed with 12 points, tying for the team-lead in rebounds with Jason Faul (Sr., Prior Lake, Minn.), each grabbing five. Gustavus closes out its season next Wednesday during Senior Night at Gus Young Court, hosting Saint John’s University.